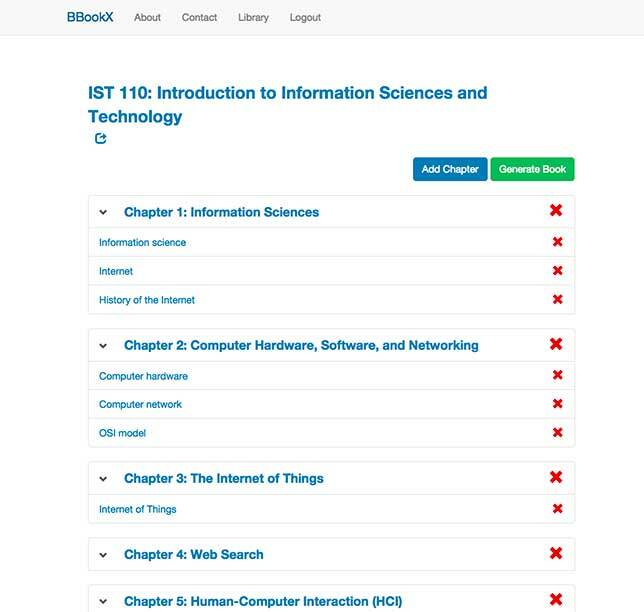 The tool, called BBookX, lets users generate textbooks chapter by chapter, adding materials by using keywords to find relevant resources, which can then be culled and organized, even edited by the user. Keywords are used to find an initial set of resources; adding the most relevant resources to a chapter then allows the algorithm to refine results for additional materials. Users can rearrange the materials within a chapter or reorganize entire chapters on the fly through a click-and-drag interface. Finished books can be embedded in Web pages or downloaded as text files for further customization or emendation. 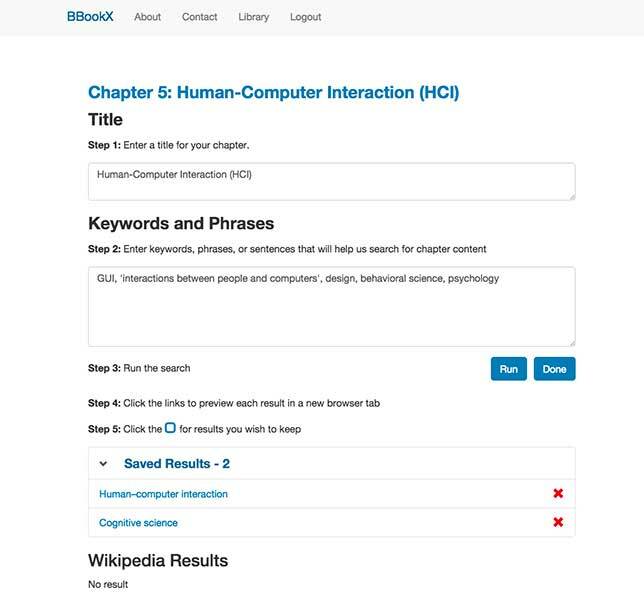 The idea of BBookX is not only to allow faculty to create texts for students that would save them on textbook costs but also to allow students themselves to become more involved in their own educations by building personalized textbooks for themselves. "Faculty can create, edit, build upon and distribute textbooks free of charge, helping to make textbooks more open, affordable and up to date," said C. Lee Giles, David Reese Professor in the College of Information Sciences and Technology that helped create the system along with staff from Teaching and Learning with Technology (TLT), in a prepared statement. "BBookX can also be a powerful learning tool for students — creating their own books gives students a better sense of what they already know and what they still need to learn." A textbook with multiple chapters ready to be shared. BBookX was developed by faculty, staff and graduate students at Penn State and is currently being tested on a limited scale. It's expected that it will be greatly expanded in the future. According to Kyle Bowen, director of Education Technology Services in TLT, "... [W]e are currently conducting a series of research pilots to both improve the technology and learn more about possible applications. As part of this research, we are actively exploring options to make the technology more widely available - but haven't yet settled on an approach. The nature of this tool is that it will be more powerful as it is used by more people. Expanding future use will be a key part of our success." While geared at present toward post-secondary education, the tool is applicable to K-12 as well; BBookX's algorithm can help users align materials to standards using simple keywords. In its present pre-release state, BBookX is runs only on top of Wikipedia, the largest repository of OER in the world, but when in wider release it will support multiple OER repositories. A pre-release demo is not yet publicly available. However, for those interested, BBookX's developers are actively seeking "schools and organizations that would be interested in partnering and supporting future research," Bowen said. Those interested in participating can contact the researchers at BBookX@psu.edu or through BBookX.psu.edu. No formal public release date has yet been set.